^ "PubMed Celebrates its 10th Anniversary". Technical Bulletin. United States National Library of Medicine. 2006-10-05. Retrieved 2011-03-22. 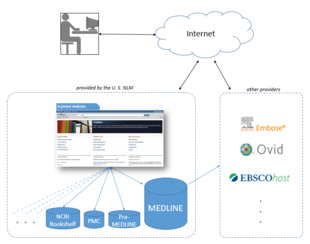 ^ "PubMed: MEDLINE Retrieval on the World Wide Web". Fact Sheet. United States National Library of Medicine. 2002-06-07. Retrieved 2011-03-22. ^ "PubMed Commons to be Discontinued". NCBI Insights. 2018-02-01. Retrieved 2018-02-02. ^ "PubMed shuts down its comments feature, PubMed Commons". Retraction Watch. 2018-02-02. Retrieved 2018-02-02.